California wildfires are unpredictable, savage beasts that rage through the land, engulfing everything in their path. If you live in an area that is prone to wildfires, you cannot leave your fate up to the hope that the wind doesn’t blow the fire your direction and wildland firefighters will combat the blaze before it reaches your home. You have to protect your home as much as you can and be prepared — the best offense is a good defense. Here, we will discuss a few ways to help protect you and your belongings from going up in flames. 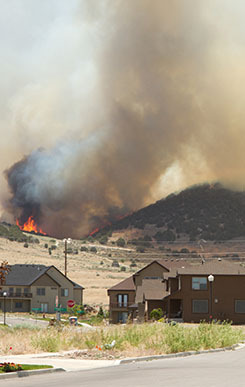 When you create wildfire-defensible zones, your property and home will be less vulnerable to wildfire. Defensible space is creating a perimeter around your house to reduce fire hazards and prevent a wildfire from becoming a house fire. Defensible zones are designated by zones; each zone has recommendations on what kind and how much vegetation and things should be in the zone. The suggested width of each zone is determined by where you live in relation to wildfire risk. Zone 1 is closest to the home and should be vegetation free. Combustible chemicals and firewood should not be kept in this zone. Zone 2 should have thinned out vegetation, and this is where combustible chemicals, such as propane tanks, should be stored on concrete slabs, at least 10 feet from each other, or vegetation. Zone 3 is where nature can be left to its own devices, but it is recommended to still clean up any dead or dried vegetation that will make good kindling. At Wholesale Direct Carports, we construct custom enclosed garages and other metal buildings out of galvanized steel. Steel is naturally fire-resistant and can help protect what is inside. 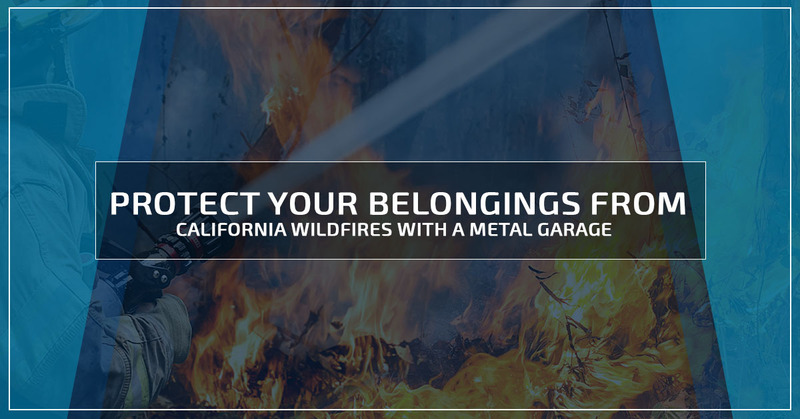 In no way can we claim with certainty that your belongings are guaranteed to survive a swooping California wildfire, but an enclosed garage does offer some help, especially from flying sparks or embers that would otherwise ignite a fire. Our metal garages are anchored to concrete, which provides stability, and can also provide protection from water. When you have one of our metal buildings installed, it is the ideal place to store firewood and combustible equipment, such as a grill or your lawn mower. When you are working to protect your home and family from California wildfires, the work begins outside, 30 to 100 feet from your home; this helps prevent the fire from reaching your home. However, it is also important to protect your house, itself. It is recommended to use metal or wire mesh for deck enclosures rather than nylon or any other fabrics. Be sure that your home inspection tested building products for the best quality products that are as fire-resistant as possible. Although no home is fire-proof, you can choose roof, siding, and deck materials that are more fire-resistant than others. Be sure not to use your deck or porch as a storage space, and a propane grill should never be within 15 feet of your home. Be sure to keep your roof, gutters, deck, sidewalks, and lawn free of dead vegetation, such as leaves. Be sure to have smoke detectors installed throughout your home, and if possible, have them connected to a device that allows you to be notified if you are away from your home. California wildfires are unforgiving and relentless. In the height of fire season, there is little anyone can do but be alert and be prepared. Create defensible spaces and be firewire in your home. Help protect your property and belongings in an enclosed garage. If you are looking for a metal building to protect your things, contact us at Wholesale Direct Carports of California. Contact one of our metal building experts to answer all your questions and find the best building to fit your needs.